Region: In Provence, but right on the border with Languedoc-Roussillon. Distance from Paris: 689 km (428 miles) by road . Nearest railway station: Avignon ville and Avignon TGV. From London: Eurostar train via Lille or Paris. Direct service seasonal. For most of the last 1500 years, the Catholic church has had at its head a pope, and the pope has been the Bishop of Rome. Yet the first thousand years of the Papacy included centuries of strife and turmoil, during which the popes, as well as being the spiritual leaders of the Catholic church, were also temporal rulers, major players in the geopolitics of Europe; they were princes with their own states and their own lands, even their own armies. Their power was like that of kings, if not greater. The medieval Papacy ruled directly over the Papal states in central Italy, and was a highly influential player in the affairs of European states in general. In the year 1271, Alphonse of Poitiers bequeathed to Pope Gregory X a domain in the south of France, on the eastern side of the River Rhone, known as the Comtat Venaissin, the County of Venaissin. Avignon, in the south of the zone, was not actually part of the Comtat, but was the most strategically important city in the area, on account of its bridge over the river Rhone - the famous "Pont d'Avignon". Seventy-seven years later, in 1348, countess Jeanne de Provence sold the city of Avignon to the Papacy, who thus became the rulers of both the Comtat and the principal city. This area remained Papal territory until the French Revolution, when it was incorporated into France. The Papacy had already established a presence in Avignon before it became a Papal city. In 1305 Pope Clement V, who was French, decided to establish his Papal court at Poitiers in France; but in 1309 he moved it to Avignon where it was to remain for the next 68 years, under seven different popes, until Pope Gregory XI moved it back to Rome. It was during this period that the great fortified Papal Palace of Avignon was built, set up as a proud symbol not just of spiritual but also of military importance, standing as it does in a highly strategic position beside the only bridge over the Rhone between Lyon and the Mediterranean sea. In 1316, Pope John XXII started the process of rebuilding and enlarging the Bishop's Palace in Avignon, and converting it into a fortified palace. 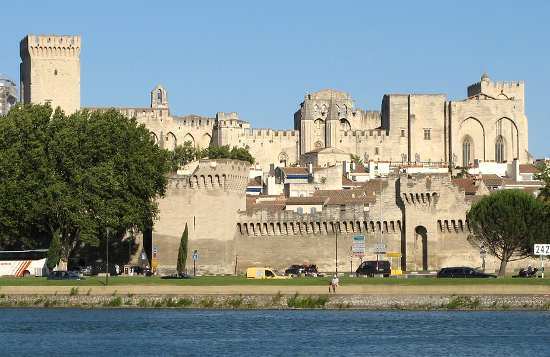 The main part of the building that stands in Avignon to this day was built under Popes Benedict XII (Benoît XII), Clement VI and Innocent VI from 1335 to 1362. In 1377, Pope Gregory XI brought the Avignon papacy to an end, by returning with the Papal court to Rome; but Avignon remained a Papal city, and Gregory's departure was not the end of Avignon papacies. The following year, the Roman Catholic church was split in two when the Cardinals refused to follow the newly appointed Pope Urban VI. Instead, they elected Robert de Genève as a rival Pope, and returned to Avignon. Thus from 1378 to 1403, during a period known as the Western Schism, Avignon was the seat of a rival Papacy, its Popes referred to by the official church in Rome as "Antipopes". The older part of the Palace of the Popes, built under Benedict XII a former Cistercian monk, is known as the Palais Vieux; it is the part on the left when seen from the square in front of the palace, and is essentially an austere fortress set round an interior cloister. When Clement VI succeeded him as Pope in 1342, he set about expanding Benedict's palace with a far more lavish and decorated extention, known as the New Palace or Palais Neuf. It was Clement who commissioned the Italian painter Matteo Giovannetti to take charge of the decoration of the interior of the Palace. Unfortunately, a large proportion of the paintings that once decorated the walls of the palace have been lost in the course of time, but several of them remain, including notably the ceiling frescoes of the prophets in the Grand Audience room, the hunting scenes in the Pope's chambers, and the decoration of St. John's and St. Martial's chapel, which survive as masterpieces of late medieval wall painting. The Avignon Bridge - known worldwide thanks to the classic song "Sur le Pont d'Avignon" - was built in the 12th century and for a long time was the only bridge across the Rhone south of Lyon. A large part of the bridge was swept away in the 17th century, and has not been rebuilt since. The ramparts. Old Avignon is still largely surrounded by 14th century ramparts. Jardin du Rocher des Doms. Just next to the Palace of the Popes, this park is on top of the rocky outcrop overlooking the river. Merits a visit on account of the views over the river and over the rooftops of old Avignon. The significant Roman remains at Orange, Arles and Nimes, plus the Roman aqueduct known as the Pont du Gard. The Camargue wetlands, famous for their pink flamingos and white horses. The old city of Les Baux de Provence. The site of the Fontaine de Vaucluse, where the river Sorgue emerges from the foot of a cliff. Ile sur la Sorgue, famous for its antiques shops and antique fairs. Matteo Giovannetti, in the Palace of the Popes.